Hello! My name is Charles Ispwapwa. I’m 11 years old. 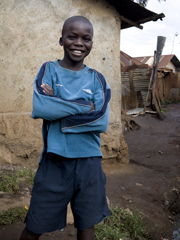 I live in Kibera, a neighborhood in Nairobi, with my aunt and cousins. 5:30 A.M. My aunt wakes me up to get ready for school. I wash my face, brush my teeth and put on my school uniform. 6:00 A.M. For breakfast, I eat mandazi, which is fried dough in the shape of a donut. My aunt also makes me a cup of tea with milk. 6:30 A.M. My cousin and I walk to school together. It takes us 30 to 45 minutes to get there. 7:15 A.M. I arrive at school. The students are supposed to get to school early to get organized before the teacher arrives at 8:00. We pray and sing songs before our first lesson, which is math. We are learning multiplication. 9:30 A.M. We take our first break of the day. It is 15 minutes long. I run around and play tag with my friends. Then, it’s back to class for our next lesson. We are learning to read and write English words. After the lesson, we take another 15-minute break. 11:45 A.M. Today, instead of our usual Swahili lesson, my class is learning about hygiene. We listen to a lecture about how to brush our teeth and wash our hands properly. 12:30 P.M. For lunch, my teacher serves me a big bowl of mixed beans and corn. Some kids go home after lunch. But I, and others, pay extra to stay at school until 3:10. I take this opportunity to get extra help from my teacher. 1:15 P.M. Now it’s time for either arts and crafts or French lessons. French is difficult, but I like drawing houses, animals or people. I like to use lots of colors! 3:10 P.M. When school ends, I meet my cousin, and we walk home. 4:00 P.M. When I get home from school, I do my chores. I walk to a nearby well to collect water for my family to shower and cook with. I also shop for dinner and wash dishes. When I’m done, I play soccer with my friends. 6:30 P.M. After I do my homework, I have dinner with my aunt and my two cousins. We eat kale and ugali, which is cornmeal cooked with water to make a porridge. We drink water. 7:30 P.M. It’s been a long day. I lie down on a mattress on the floor, curl up under a blanket and go to sleep. Good night!